"I don’t want you lads to get your new clothes dirty," Mum said. "Aw, Mum, why do we have to dress up in these clothes. We’re bunnies, not people," Gilbert complained. "Mum, I hate wearing clothes too," wee Alex added. "Me too," Johnny chimed in. "Now lads, you know that you have to look like proper gentlemen today. Auntie Peggy is coming and she made those clothes for you. She’ll feel very sad if you’re not wearing them. Run off and play for a while, but don’t get your clothes dirty," Mum said. The bunnies hopped off towards Mr. Jock’s carrot patch. "Don’t get dirty!" she shouted. The three bunnies hopped quickly. "I am starving. I want a big carrot," Gilbert said. "We have to be careful, Gilbert. You heard what Mum said. We can’t get dirty," Alex reminded. "We won’t get dirty. All we’re going to do is dig up a few carrots. Come on, let’s pull a few up," Gilbert said to his brothers. He used his paws to dig the dirt away from the first carrot. "Wow! This is a big one. Help me pull it out." Johnny and Alex grabbed part of the carrot and together they pulled. The carrot slipped out of the ground. "This one’s for you, Alex. Hold it tightly," Gilbert said, handing the carrot to his wee brother. "Johnny, help me pull this one out." The two bunnies tugged at it until it came out of the ground. "Great! This big carrot is yours, Johnny," Gilbert said, handing it to him. "Hold it tightly. Don’t drop it." Gilbert pulled and tugged and pulled and tugged and finally got the biggest carrot out of the ground. He wobbled over to the others, barely able to carry the huge carrot. "Let’s eat." The three bunnies munched and crunched their carrots until all that was left was the green top. "Yikes!" Alex shouted. "Look at our clothes!" "Mine is covered with carrot juice and stained with dirt," Johnny cried. "I’ve got dirt and leaves and carrot chunks all over mine," Gilbert sighed. "Mum’s going to be really angry with us." "Look at me!" Alex said. He was the messiest of them all. "These stains will never come out. What should we do?" Gilbert had an idea. "Let’s go to the stream and wash our clothes. We’ve got time before Auntie Peggy comes." "Great idea!" Johnny agreed. The three bunnies ran down to the stream. They took off their brand new clothes and washed them in the water. Soon there were no more stains left on any of them. "How will they get dry?" Alex asked. "Well, we’ll have to lie in the sun for a while," Gilbert suggested. The bunnies put on their wet clothes and lay in the sun. What they didn’t realize is that their clothes weren’t supposed to get wet. They shrunk! "Gilbert! Johnny! Alex! Auntie Peggy’s here and she can’t wait to see you in your clothes," Mum called. "Gilbert, my shirt is too tight. It hurts," Alex whined. "Mine’s a bit tight on me too," Johnny said. "The pants are squishing my tail." "Johnny? Gilbert? Alex? Where are you?" Mum called. "Let’s hope Mum and Auntie Peggy doesn’t notice," Gilbert said. The three bunnies hopped back to their mum. "What in the world?" Auntie Peggy gasped. "I’m so sorry. I made the lads clothes too small for them. Look how tight they are. Oh, you poor lads. Let Auntie Peggy take them back home and fix them up for you." 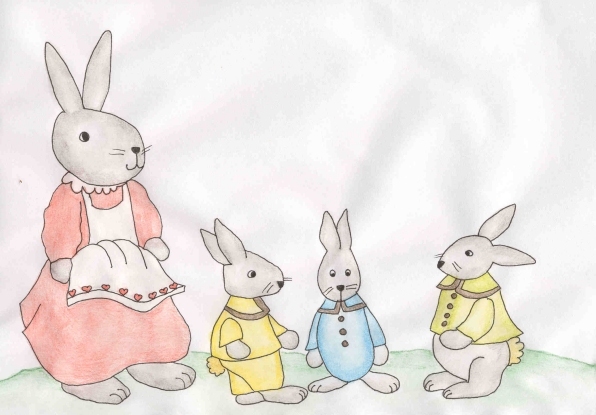 The bunnies took off their clothes and handed them back to Auntie Peggy. "I’ll bring you new ones that fit in a few days. Oh dear, I’m so upset. I must go home right now and fix up these clothes." She hopped away. Gilbert looked at Johnny and smiled. Johnny looked at Alex and smiled. Just when they thought they’d gotten away with it, Mum said to Alex, "Well, young man, would you like to tell me why suddenly the clothes shrunk, or did you grow two inches in a matter of hours?" Alex started to cry. "It was Gilbert’s idea. He took us to the carrot patch and made me hold the carrot and it got dirt all over my clothes, and juice and leaves. I’m sorry, Mum. We went to the stream and tried to wash them out and then lay in the sun until they were dry. They shrunk." Alex sobbed and sobbed and sobbed. Mum looked at Gilbert and Johnny, who were now in trouble. "Well, lads? What do you have to say for yourselves?" Gilbert and Johnny didn’t say a word. Their mum made them stay in the rabbit burrow for three days. When Auntie Peggy came back, she had finished their clothes. She waited while they tried them on. "Perfect," she said. "You look like little gentlemen." Gilbert frowned. Johnny frowned. Alex frowned. Auntie Peggy smiled and so did Mum. She knew the lads wouldn’t be happy, but they did look like little gentlemen.